The reputation of this woman from Quebec goes far beyond the framework of the organization L’Entraide missionnaire, which she has directed in Montreal for the past thirty years. Suzanne Loiselle has forged fast ties with a vast network of international cooperation agencies. The many struggles for peace and human rights which she has supported have taken her to Iraq with a Quebec delegation headed by Objection de conscience organisation. Her actions and forceful public statements reveal her strong bond with oppressed populations. Inspired by a theology of liberation, her vision of the world is both caring and critical. She holds special affection and compassion for the people of Haiti, whom she visits regularly and defends in her information capsules and her advocacy work. As spokesperson for and one of the founding members of Collectif Échec à la guerre, she bravely expresses her concerns regarding the disturbing trends of globalization and the Canadian government’s foreign policy. Suzanne is a member of the international congregation, Sœurs Auxiliatrices. She was first a teacher. She then practiced unionism in the education milieu, where she developed her talents as a convincing speaker, a speaker able to deliver a clear and forceful message. She is an unstoppable mobilizing force particularly when it concerns defending the interests of women, workers and vulnerable communities. L’Entraide missionnaire, an organization established and supported by religious congregations and which provides missionary formation, closely monitors North-South relations. Suzanne Loiselle’s addresses which open the organization’s annual meetings provide a masterful overview of the issues relative to international solidarity and mission. It is part of the heritage that is left to us by this woman of vision and action who has dedicated her life to create a world without exclusion. 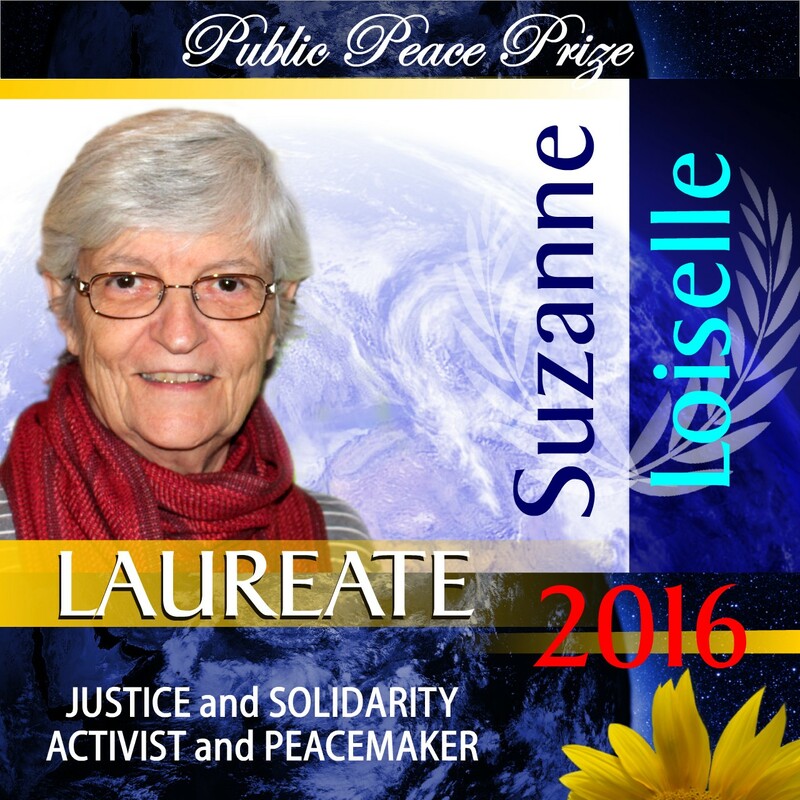 Suzanne has been Quebec’s public voice for peace in the Middle East for more than a decade. She has been a tireless defender of the ordinary people in Iraq, Syria and Palestine. She has been key in bringing awareness to an entire generation here. To recognize her is to recognize the solidarity of the people of Quebec with the struggling people of the Middle East. I have known Suzanne for over 40 years. I have followed her endeavors for peace and justice. She has been relentless in dedicating herself to the work of justice by going on fact finding missions in Haiti , Iraq, and other parts of the world and educating others about the ramifications of political decisions that affect the poor. Her perseverance in the work of justice deserves praise and recognition. For your international work and your concern for women. For your caring in many everyday ways. I have known Suzanne for over 40 years. Her indefatigable efforts for justice for the poorest of the poor have never wavered. She has given herself to the work of peace with joy, hope, and relentless endeavors, traveling to countries at war as well as working on site in Quebec where her leadership in Entr’aide Missionnaire has served to educate many to an understanding of the unjust structures that perpetuate poverty and war.